Riverside is a well-funded exploration company that is driven by value generation and discovery. The Company has a strong portfolio of gold-silver and copper assets in North America. 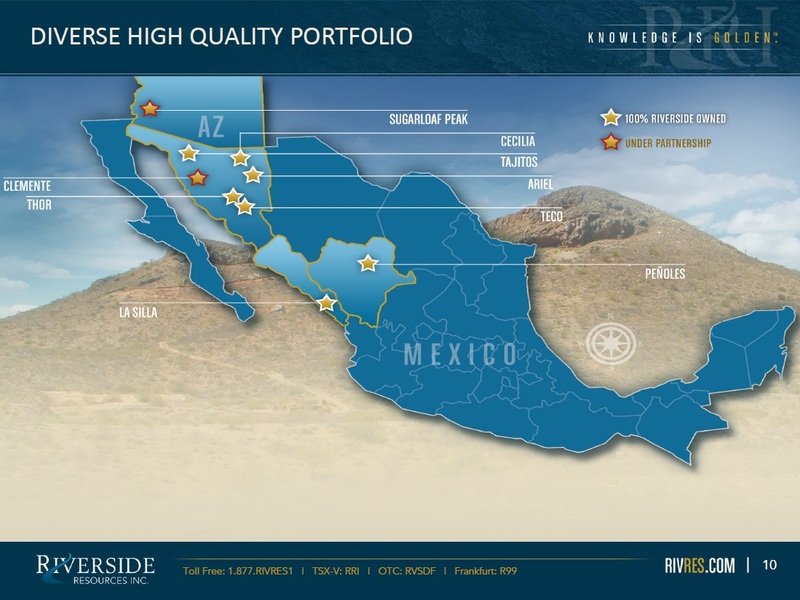 Riverside has extensive experience and knowledge operating in Mexico and leverages its large database to generate a portfolio of prospective mineral properties. 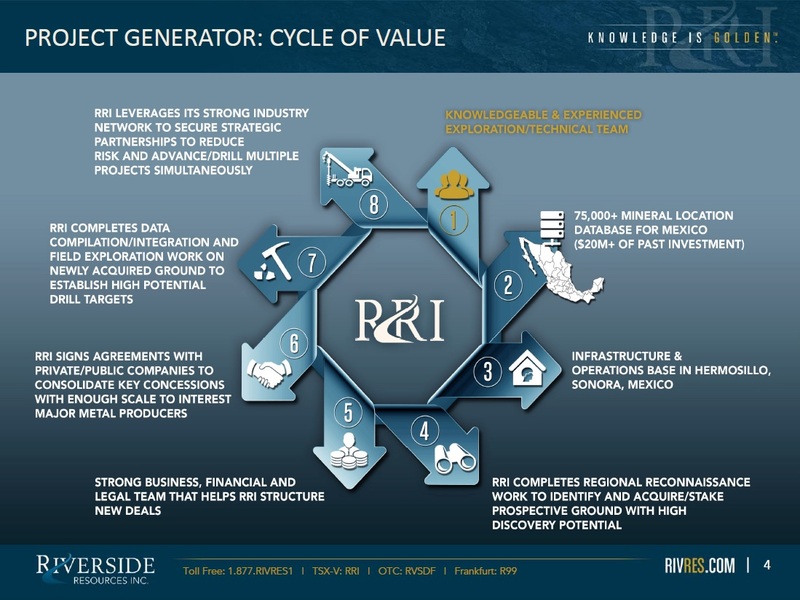 In addition to Riverside’s own exploration spending, the Company also strives to diversify risk by securing joint-venture partnerships and spin-out entities to advance multiple assets simultaneously and create more chances for discovery. Riverside has additional properties available for option, with more information available on the Company’s website at www.rivres.com. Past partner-funded drilling, underground sampling and trenching at the historic Jesus Maria silver mine discovered high-grade Ag. Large, 36 sq. km Glor Project land package, active program. Project field work completed in the spring of 2018 focused on the new Canasta target, where soil survey and rock sampling results have been encouraging, with a number of bedrock occurrences of gold and base metal mineralization being discovered. Geological mapping and interpretation of aeromagnetics data has identified a 3.5 km long structural zone on the property, which appears to be prospective for gold mineralization. In June of 2018 Riverside geologists collected 52 chip, channel and grab samples over the past month during a focused exploration program with assay results ranging from <0.05 up to 19.9 g/t gold and from <0.05 up to 200 g/t silver. Five of the samples returned greater than 1 g/t gold. The new sampling program appears to have extended the strike length of known veins, while also identifying new vein structures at the La Silla Project. Mr. Staude has over 20 years of diverse mining and exploration experience in precious and base metals. He earned a Master of Science from Harvard University in 1989 and a Ph.D. in economic geology from the University of Arizona in 1995. Mr. Burk has 30 years of work experience in the minerals industry, primarily focused on generating and evaluating exploration properties. He most recently worked at Centerra Gold Inc. as VP of Exploration. Prior to this, he held the positions of VP, Exploration and Chief Geologist at Silver Standard Resources Inc.
Mr. Herrera has more than 20 years of exploration experience throughout Mexico. Mr. Scott has over 17 years of professional experience in the areas of corporate finance, accounting, and merchant and commercial banking. Mr. Smith has 19 years of professional experience in the resource industry working with Oro Gold, BCGold Corp. and Goldplay Explorations. Mr. Cazares has over 10 years experience working with Yamana Gold and Riverside Resources. Mr. Goldsmith is a Professional Engineer and a Geologist with more than 45 years of exploration worldwide. Mr. Lang is an experienced business development and capital markets professional with 10 years of experience in the mineral resource sector. On February 19, 2019, Riverside Resources Inc. announced that its partner Sinaloa Resources Inc. entered into a definitive agreement signed on Jan. 30, 2019, that begins with an initial option to acquire a 70-per-cent interest in the La Silla project. Sinaloa Resources has issued Riverside one million common shares and now paid $60,000 total in cash. 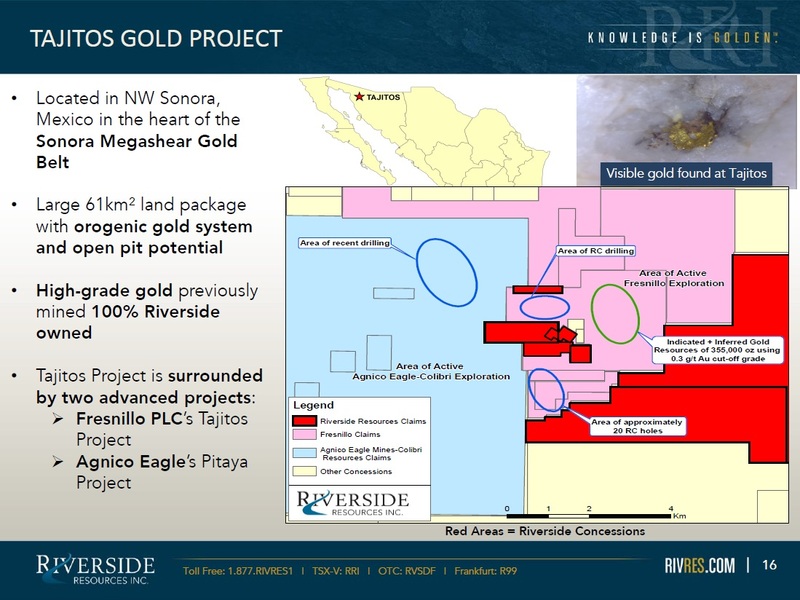 Riverside and Sinaloa Resources expect the commencement of a first-phase $300,000 exploration program in the coming months, as per the agreement. To earn an additional 30 per cent, Sinaloa Resources must incur a further $1-million in exploration work and issue Riverside additional Sinaloa Resources shares at a value of $500,000. Riverside will retain a 3-per-cent net smelter return (NSR) on the project should Sinaloa Resources complete 100-per-cent earn-in, or Riverside's interest dilutes to less than 10 per cent. On January 9, 2019, Riverside Resources Inc. has provided a brief outlook for the coming year. 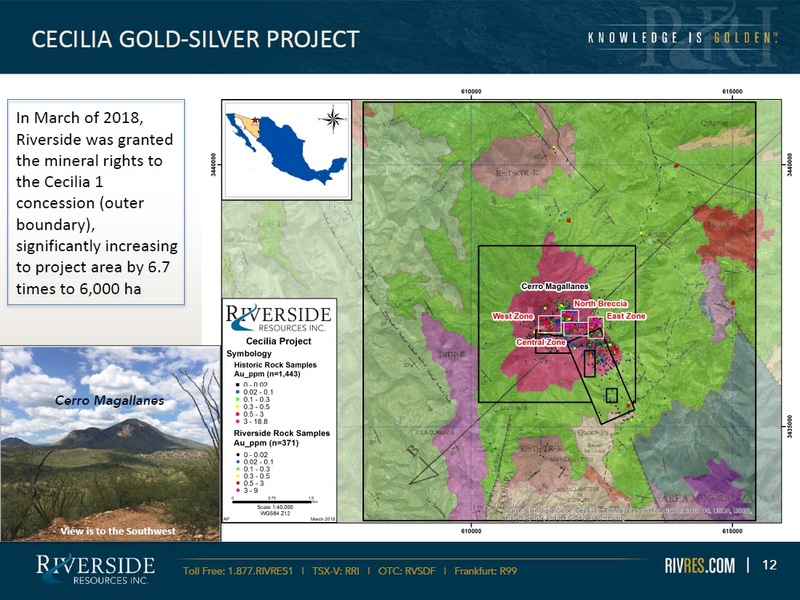 Riverside is pleased to enter 2019 with a stable of high-quality gold, silver and copper exploration assets in Mexico. Riverside continues to have a tight share structure (less than 45 million shares outstanding); increasing the potential for strong share price appreciation on new exploration successes. 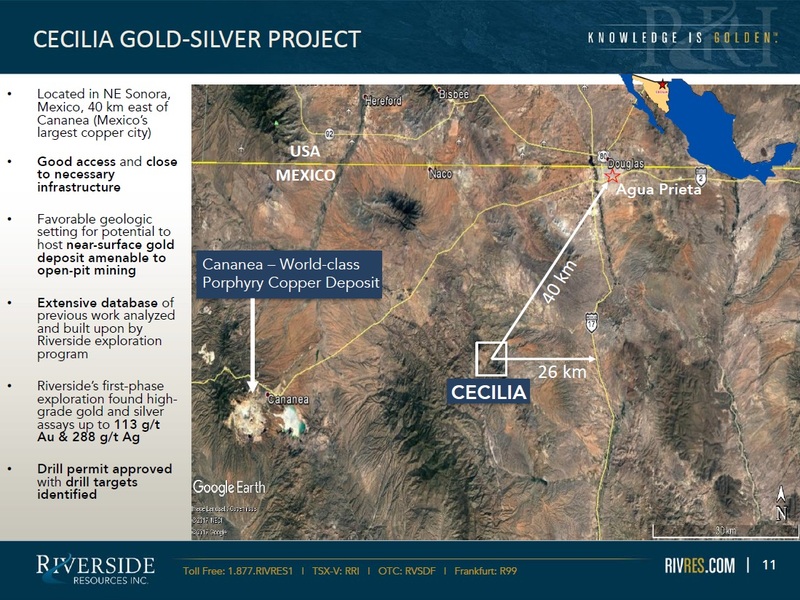 On November 15, 2018, Riverside Resources Inc. announced that it has developed four additional targets at 100-per-cent-owned Cecilia gold project in northeastern Sonora, Mexico. On October 2, 2018, Riverside Resources Inc. has released results from rock chip channel samples from the Cerro Magallanes area at the 100-per-cent-owned Cecilia gold project in northeastern Sonora, Mexico. East target -- 11.5 m at 1.57 g/t from surface channel. On September 25, 2018, Riverside Resources Inc. announced that it has been listed for trading on the OTCQB Venture Market in the United States under the symbol RVSDF. On July 11, 2018, Riverside Resources Inc. and Sinaloa Resources Inc. jointly announced that they have signed a letter of intent whereby Sinaloa can earn up to 100% interest in Riverside’s La Silla Project located in Sinaloa, Mexico. 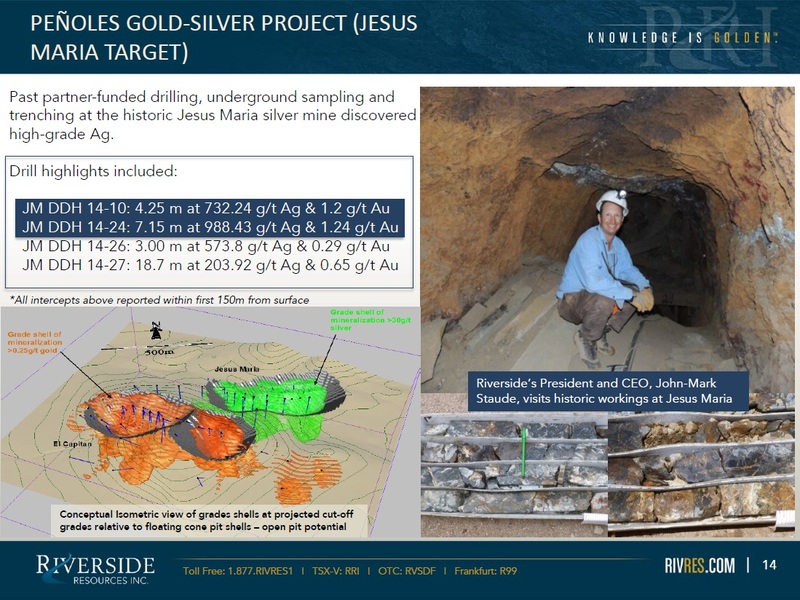 On June 19, 2018, Riverside Resources Inc. announced results from exploration work on its 100%-owned La Silla Gold Project located 75 km northeast of Mazatlan in Sinaloa, Mexico. Riverside geologists collected 52 chip, channel and grab samples over the past month during a focused exploration program with assay results ranging from <0.05 up to 19.9 g/t gold and from <0.05 up to 200 g/t silver. Five of the samples returned greater than 1 g/t gold. The new sampling program appears to have extended the strike length of known veins, while also identifying new vein structures at the La Silla Project.